This was one of my birthday gifts. Picked it up at my favorite book store, Joseph Fox on Sansom Street, Philadelphia. Only a short walk from our studio on Walnut Street. If you need to be inspired or want to check out how many of the things you own are one of the 999; you’ll have to pick up your own set. Bring along your shopping cart or plan on taking a cab ride these puppies are hefty. I’ve begun putting post it notes to mark the objects I own… the others I can add to my objects of desire. smARTS GROUP SHOW, I’m in. 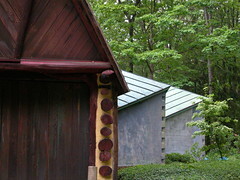 For my birthday we decided to make a visit to the Wharton Esherick Museum. I’m not really interested in the furniture very much; its the buildings that interest me. This photo gives you an idea of what can happen when you build your own place. I saw this intersection and thought: “wow its a folding thing — sort of a cross between a hand machine cut dovetail and origami. The color of the surface is luminous in the overcast light. 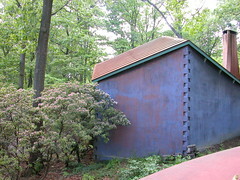 The mixture of magenta and blue imitate a springtime sunset. The contrast of textures is endless and I wanted to spend more time outside than in; lucky for me since you can’t take photographs inside. The museum is located only a short distance from the southwest boundary of Valley Forge National Historic Park off Exit 24 of the Pennsylvania Turnpike. Do you want Comast to own the net? Do you want anyone but the public to control the net? I read this essay today and needed to pass it around. The big guys are starting to bind up one of the last democratic spaces we know. A place for free expression and diversity of viewpoint is in danger. Congress may vote this week. This week, the House is expected to vote on something termed, in perfect Orwellian prose, the “Communications Opportunity, Promotion and Enhancement Act of 2006.” It will be the first real battle in the coming War of Internet Democracy. On one side are the companies that pipe the Internet into our homes and businesses. These include telecom giants like AT&T and Verizon and cable companies like Comcast. Call them the pipe companies. On the other side are the people and businesses that send Internet content through the pipes. Some are big outfits like Yahoo, Google and Amazon, big financial institutions like Bank of America and Citigroup and giant media companies soon to pump lots of movies and TV shows on to the Internet. But most content providers are little guys. They’re mom-and-pop operations specializing in, say, antique egg-beaters or Brooklyn Dodgers memorabilia. They’re anarchists, kooks and zealots peddling all sorts of crank ideas They’re personal publishers and small-time investigators. They include my son’s comedy troupe-streaming new videos on the Internet every week. They also include gazillions of bloggers-including my humble little blog and maybe even yours. Until now, a basic principle of the Internet has been that the pipe companies can’t discriminate among content providers. Everyone who puts stuff up on the Internet is treated exactly the same. The net is neutral. The pipe companies claim unless they start charge for speed and reliability, they won’t have enough money to invest in the next generation of networks. This is an absurd argument. The pipes are already making lots of money off consumers who pay them for being connected to the Internet. The pipes figure they can make even more money discriminating between big and small content providers because the big guys have deep pockets and will pay a lot to travel first class. The small guys who pay little or nothing will just have to settle for what’s left. The House bill to be voted on this week would in effect give the pipes the green light to go ahead with their plan. Price discrimination is as old as capitalism. Instead of charging everyone the same for the same product or service, sellers divide things up according to grade or quality. Buyers willing to pay the most can get the best, while other buyers get lesser quality, according to how much they pay. Theoretically, this is efficient. Sellers who also have something of a monopoly (as do the Internet pipe companies) can make a killing. But even if it’s efficient, it’s not democratic. And here’s the rub. The Internet has been the place where Davids can take on Goliaths, where someone without resources but with brains and guts and information can skewer the high and mighty. At a time in our nation’s history when wealth and power are becoming more and more concentrated in fewer and fewer hands, it’s been the one forum in which all voices are equal. Will the pipe companies be able to end Internet democracy? Perhaps if enough of the small guys make enough of a fuss, Congress may listen. But don’t bet on it. This Congress is not in the habit of listening to small guys. The best hope is that big content providers will use their formidable lobbying clout to demand net neutrality. The financial services sector, for example, is already spending billions on information technology, including online banking. Why would they want to spend billions more paying the pipe companies for the Internet access they already have? The pipe companies are busily trying to persuade big content providers that it’s in their interest to pay for faster and more reliable Internet deliveries. Verizon’s chief Washington lobbyist recently warned the financial services industry that if it supports net neutrality, it won’t get the sophisticated data links it will need in the future. The pipes are also quietly reassuring the big content providers that they can pass along the fees to their customers. Will the big content providers fall for it? Stay tuned for the next episode of Internet democracy versus monopoly capitalism. Robert Reich is professor of public policy at the Richard and Rhoda Goldman School of Public Policy at the University of California, Berkeley. He was secretary of labor in the Clinton administration. 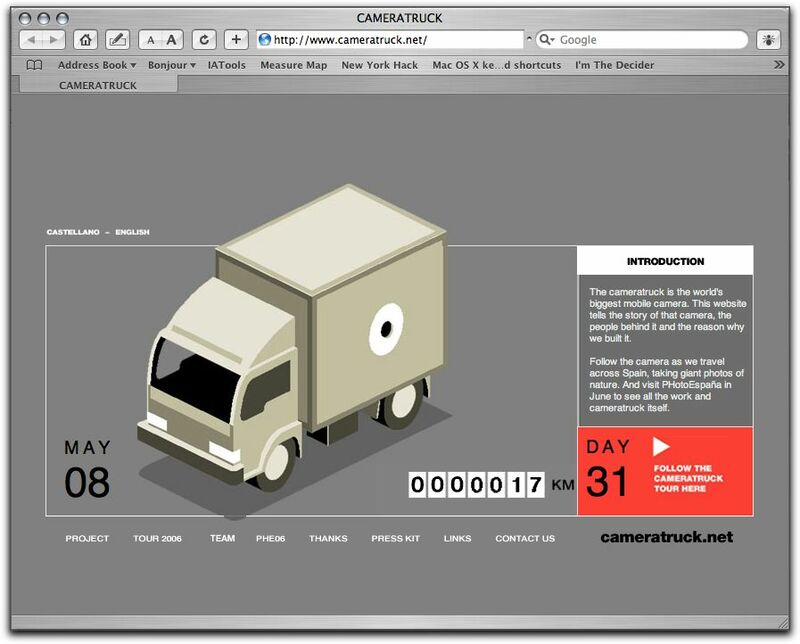 If you know what a pinhole camera is then I’m sure you find this concept intriguing. 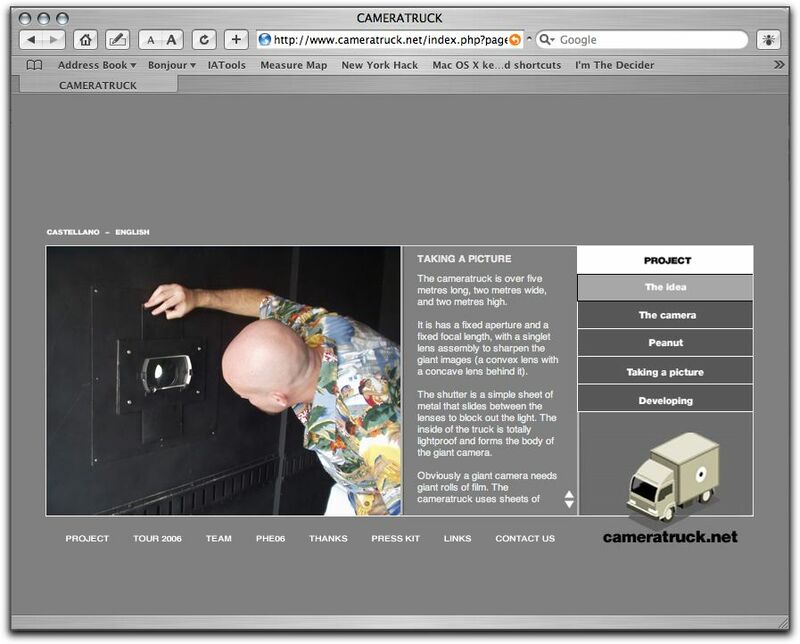 If you want to know more about pinhole cameras you can google it. Basically it is a camera without a lens, just a little hole that the light travels through to the back of the camera where the film resides. If you want to make your own pinhole and try this on a smaller scale there are plenty of good options. You could make one out of an oatmeal box. Or go over to Lomo and buy one of these sweet wooden pinhole cameras. They have a great description of how a pinhole camera works here. Wanda Scott has a terriffic site. She makes pinhole cameras out of anything! June 3rd will be a artful day at Sherman Mills. I will be participating in the open studios and entering work for inclusion in the juried show. A brand new gallery space is being readied now for a show that will contain works from the Sherman Mills ARTS community. Building 32 the largest of the artist studio buildings will have an open show in the first floor lounge. 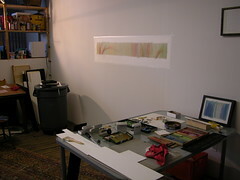 Open studios work includes painting, drawing, fiber arts, glass, ceramics, and scupture. East Falls Glassworks : Open House with glass blowing demonstrations. Crafts for Living Gallery : Philadelphia Guild of Handweavers. Juried show of emerging and acknowledged weavers and fiber artists. Sherman Mills in East Falls : a diverse community where people live work and play. Click here for google map to find us. This is a great little drive. Size of a credit card. What makes it great? You can carry plenty of stuff. 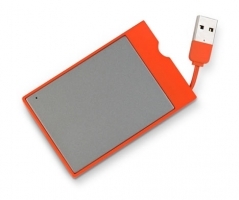 Back up your camcorder, your mp3 library, or back up all the photos from a days raw. And’s easy to find in Safety Orange. The best place to buy it — smalldog of course. I read this in the NYTimes today. The last above-ground remnant of the World Trade Center — a battered but still —recognizable staircase down which hundreds fled to safety on 9/11 from the inferno in the north tower — is one of the most endangered historical places in America, the National Trust for Historic Preservation said today. The last above-ground remnant of the World Trade Center — a battered but still—recognizable staircase down which hundreds fled to safety on 9/11 — has become one of the most endangered historical places in America. “Silverstein Properties has not made a commitment to preserve the staircase and we’re urging them to do so,” said Richard Moe, the president of the trust, a private, nonprofit organization that uses its considerable influence in place of any actual regulatory power. You may need to be registered if the story is more than a week old. Looking at this stairway instantly reminded me of the memorial to the dead of the USS Arizona at Pearl Harbor. It is a place frozen in time. Those that visit are transported to a place silent yet vibrating with the events that took place there. Saving this stairway says something more than building a memorial; it grounds us in truth that surrounds us. Well, the decision is in… Apple can use the apple. Does anyone really know who Apple Corps is anymore? The granny smith that adorned the last of the Beatles Albums is a dim memory. Do they continue to distribute Beatles music I really don’t know. I do know that I have been waiting and waiting and waiting for Beatles music to be remastered and available in digital format. What are they thinking? 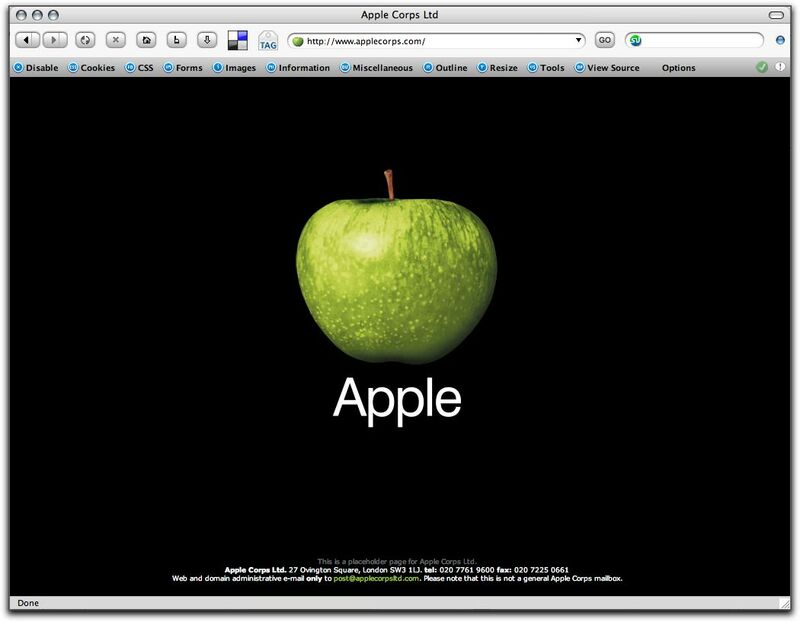 This image is a capture of the Apple Corps website. One screen and if you look at the bottom (you can enlarge the image by clicking on it) you can see that the page is a placeholder. This is an example of the kind of thinking that led Apple Corps to believe that they would win in court. What kind of thinking — old thinking. The idea of transferring bits and bytes that are just data until they meet an application at the end of another piece of hardware is still not in Apple Corps field of vision. It cost them this case. It is 2006 and Beatles music is still not available in digital form. What are they thinking. Seems to me if the concentrated on getting their music into digital form for distribution on the web they could have made the money they spent to go to court. The question is will Apple Corps continue to posture or get their music on the web? Growl is one of my favorite new technologies. It allows applications to provide [the user] information about actions they have taken without you having to switch out of the application that you are currently using. I love that it lets me know when a download is complete or that I have gotten new mail and I can scan the sender, subject, and a short excerpt of what is contained in the message. Requires Mac OS X 10.3.9 or above.